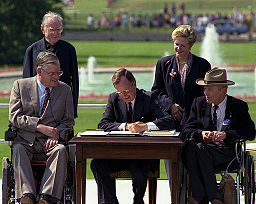 President George H. W. Bush signed the Americans with Disabilities Act (ADA) into law on July 26, 1990. It was the first comprehensive civil rights law for people with disabilities. It prohibited employment discrimination and required access to public facilities, transportation, and telecommunications. To show your commitment to the ADA, you can sign the pledge at the nationwide ADA Anniversary website. 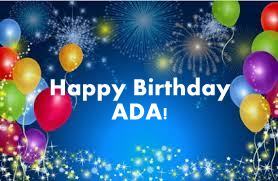 We had our ADA celebration on Saturday, July 25, 2015, from 11 am to 2 pm, at Hilyard Community Center, 2580 Hilyard St, Eugene, OR 97405. We thank our co-sponsors Hilyard Community Center, the Northwest ADA Center, Taste of Technology, and Trillium.